Financial management of IT resources allows an IT department to be transformed from a cost center to a service provider. One aspect of this is usage accounting, which helps the IT department understand the usage patterns of its customers or users and allows for service charges that reflect that usage. In addition, usage data demonstrates how IT operations can be optimized to increasing efficiency. Tivoli Usage and Accounting Manager provides the tools to perform data collection and accounting for IT-related usage from various sources. It even allows the custom integration of data from non-standard format sources. It supports the whole life cycle of financial management from budgeting to usage accounting and billing, to reporting. 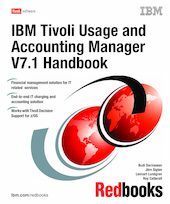 This book will help you understand, install, configure, and use the new IBM Tivoli Usage and Accounting Manager V7.1. The discussion starts with an overview of Tivoli Usage and Accounting Manager concepts and capabilities along with the structure of the product. The installation and verification of each component is presented in detail. Sample scenarios are executed and explained, including Operating System usage collection, virtual environment collection (VMware ESX server and System p partitioning), and Tivoli Decision Support for z/OS interface.